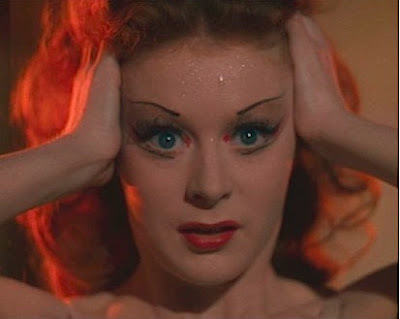 Powell and Pressburger's lush, Technicolour fever dream, The Red Shoes (1948), is probably one of the greatest British films ever made. It was a huge risk for Rank, the film's backers, and when J. Arthur and his assistant clapped eyes on the finished article they both walked out of the screening and disowned it. It was only its success in America that prevailed against indifference from the studio and some rather sniffy remarks from the critics of the time who found the tragic ending apparently in poor taste. Powell would be dogged by such accusations throughout his career, reaching a final showdown with the superlative Peeping Tom (1960). Powell and Pressburger's work would go on to influence a whole generation of film makers, everyone from Martin Scorcese to Derek Jarman. Now, thanks to Scorcese's The Film Foundation, we have a beautifully restored, high definition release of the film. Recently premiered in Cannes, it's a delight to revisit one of my all time favourite films and submerge myself in the glow of its vivid Technicolour hues. There's nothing like Technicolour. It invests colour with an ultra-realistic vibrancy, immediately creating a sense of the real and the unreal. a heightened visual quality. It's perfect for Powell and Pressburger's deliberate steer away from realism in the post war years, transforming the settings of The Red Shoes and Black Narcissus into thick, palpable dream landscapes battered by storms of repression, sexual jealousy and obsession. The Red Shoes is essentially about being an artist, what it takes to be an artist and whether you can sacrifice the life you have with those closest to you in order to live your dream. The narrative, concerning aspiring ballerina Vicky Page and hopeful composer Julian Craster, works on a number of levels. Based as it is on Hans Christian Andersen's fairy tale, this is partly an odyssey about success, about how Vicky and Julian defy the odds to gain the notice and approval of the Svengali-like director of the Ballet Lermontov but at a terrible cost. 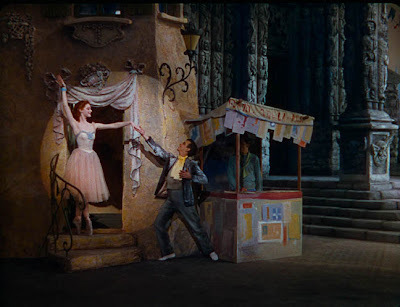 Where Julian wins his place in the company through dogged and aggressive determination, Vicky receives her reward, the lead role in the ballet of The Red Shoes, through compromise and obedience. Lermontov, the master of all he surveys, is so obsessed by his art that he will not allow the human frailties of love and marriage to interfere with his goal. Thus, Vicky also ascends to her major role because she is virtuous and chaste. This Cinderella-fable then switches over to a full blown romance between Vicky and Julian that reveals the bitter heart that Lermontov possesses. Like the cause and effect of a fairy tale narrative, Vicky is caught between her love for Julian and the driving and obsessive desire for her art as dictated by Lermontov. The film sets the audience up, typically for the time, for a joyous union between Vicky and Julian and a 'happy ending'. The union occurs but the happy ending does not because of Lermontov's dictat that a life lived through art must not be distracted by 'adolescent nonsense' . Vicky literally gives her life for her art and her husband Julian, finishing up mangled on a railway track. The relationships between the dance company and Lermontov can be seen as that that exists between a tyrannical father and his disobedient children. It is Lermontov's stranglehold on both the male and female members of the company that Julian must attempt to wrest control of if he is to save Vicky from Lermontov's sexual obsession with her. It is only until Vicky's role overlaps with that of the similar figure in Andersen's fairy tale that her own sexual potency is released and she and Julian fall in love. Despite her success, Lermontov disapproves of her relationship with Julian and eventually dismisses him from the company. Vicky, even after attempting to resolve the sexual jealousy of the 'father' of the company, leaves and marries Julian. 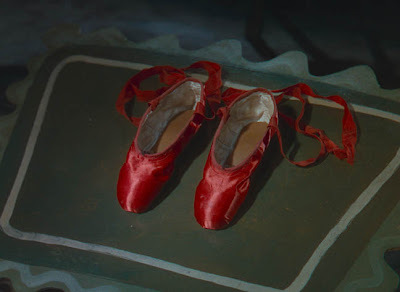 It is only when Vicky is persuaded to dance the ballet of The Red Shoes again by a frustrated Lermontov that we see the film overlap the fairy tale elements of the Andersen story and the ballet and the film to seal Vicky's fate. She is forced to chose between Lermontov's life lived through art and her love for Julian and as she leaves for the stage, she is apparently possessed by the red shoes she wears for the ballet. The shoes carry her out of the theatre and over a balcony into the path of an oncoming train, while a horrified Julian looks on. It is at this point that the film's interplay between masculine and feminine roles reaches a climax and seems to suggest that Lermontov's art can only be a success through the absence of female sexuality. This absence is also confirmed when Lermontov must watch the ballet performed without Vicky being present, invisibly as it were, as a final punishment to himself. The narrative cycle of a fairy tale, retold as the making of a ballet and within the structure of a film of the ballet is completed. It is a stunning film with a complex web of desire, living and dying for your art, thwarted ambition and a disturbing deconstruction, from the male perspective, of the conflict for women between career and life as a wife. 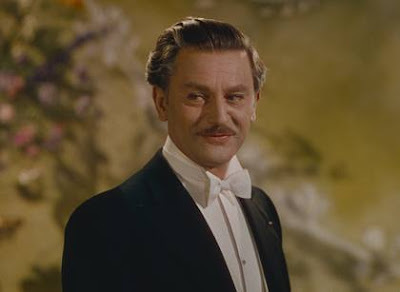 At the centre of the web is a mesmerising performance by Anton Walbrook as the icy Lermontov, barking commands from the shadows, gimlet eyed and unemotional until a sudden explosion of frustration, failing to bring Vicky back to the company, when he smashes the mirror in his office. His final speech in front of the theatre curtain at the end of the film, screeching in agony, will set the hairs up on the back of your neck. 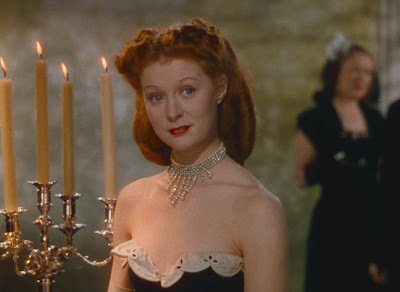 Moira Shearer, a ballet dancer of great reknown at the time, is delicious and luminous as Vicky and despite her ingenue status as an actor she conveys precisely the journey that Vicky naively undertakes under the direction of Lermontov. Apart from Marius Goring, Esmond Knight and Albert Bassermann, the rest of the cast were actually formed as a ballet company from professional dancers, including Leonide Masine and Robert Helpmann. Their heightened performances shouldn't work but strangely within Powell's cinema of anti-realism they do. 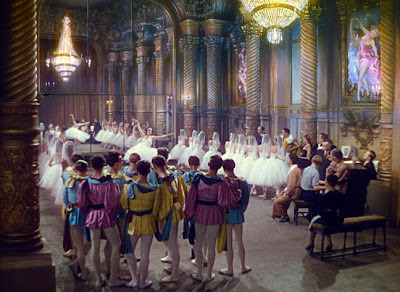 At the centre of the film is the 17 minute ballet of The Red Shoes. What makes this a tour de force is that it isn't simply a film camera filming a ballet. The camera takes us inside the ballet, its narrative, visual allusions and dream landscapes. 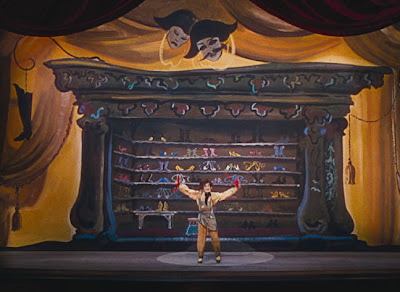 It still impresses even today with its playfulness in the use of cinema trickery (the moment Vicky is seen to walk right inside people at the start of the ballet is superb), supreme uses of editing (the sequence where Vicky playing the girl Karen in the Andersen story literally leaps, on point, into the red shoes and they tie themselves to her feet is utterly magical) and gorgeous, often heartbreaking music from Brian Easdale. It is surreal and hallucinatory, with Hein Heckroth's designs echoing his beloved surrealists, particularly de Chirico and Dali, full of shadowy hallways, cavernous ballrooms, waves crashing onto the stage, bizarre landscapes and newspapers turning into dancers. Magical. This is a film that gets inside you, particularly if you happen to have creative bones in your body, because as Powell has argued, ..."we had all been told for ten years to go out and die for freedom and democracy, for this and for that, and now that the war was over, The Red Shoes told us to go and die for Art." This intention bursts from the screen, now resplendent in its blazing colour restoration and, despite its elitism, becomes a searing examination into what drives the artistic impulse and why we need art, cinema, dance and music to illuminate the lives we lead. The Blu Ray release from ITV DVD is exclusive to HMV for the moment (the DVD version is available everywhere) and it comes with a previously released 'Profile Of The Red Shoes' documentary, various galleries, a short animation of Hein Heckroth's designs for the ballet and a trailer. Whilst it may be meagre on special features, it's the restored high definition transfer you'll be wanting to see. Jack Cardiff's cinemaphotography has never looked as sumptuous as this on previous DVD editions. Scenes are full of detail that before seemed somewhat muddier. Sound wise it's perfectly acceptable mono, cleaner sounding than before, but on the minus side there is a problematic scene at the end of the film were Vicky and Lermontov are in her dressing room and the synching of dialogue goes very awry for about 20-30seconds. Whether this is a mastering fault or a problem inherited from the original print, who knows?